The national poker spotlight shines brightest on The Star in Sydney today as the final nine players return to the felt to decide the winner of the Opening Event of the 2013 ANZPT Sydney series. A line-up of 155 players returned to Star Poker yesterday in pursuit of one of 90 spots in the money and a shot at the first prize of $60,065, generated by a huge field of 863 in this $330 No Limit Hold’em event. Trudie Sultana holds a big chip lead over her nearest challenger Dien Duy Nguyen. Others who reached the final table were Evan Ryan, Nizar Nakhle, Joseph Alvaro, past NPL500 runner-up Ray Ruiz, Damien Hubbard (chasing successive cashes in this event), Jason Clissold and the short stack Evgeny Zaydenberg. Action is scheduled to kick-off at 2pm. The other highlight of the day is the fourth edition of the $1100 buy-in PokerMedia Australia No Limit Hold’em Special Event from 12.30pm. First run at this series in 2012, the inaugural PMA No Limit Hold’em Special was taken out by Blaze Scott-Hutchinson, who pocketed $29,400. 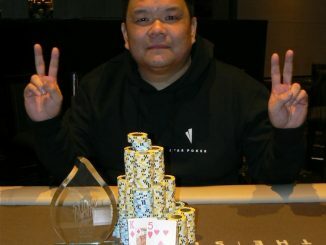 Local poker icon ‘Toothpick Tony’ Kambouroglou claimed the PMA title at the Sydney Champs (for $25,800) then at the Star Poker Summer Series in December, Sayed Jabbour took home the first prize of $26,000. PMA’s Ben Blaschke will be reporting live from The Star throughout the day as the first two winners of the ANZPT Sydney tournament series for 2013 are decided.